Excellent Interface and large collection of tools and add-on modules. Model complex hull geometry with trimmed surfaces and visualise hull shape changes with dynamic updating. Modify with Parametric transformation. Extract key design data via lines, offsets, hydrostatic properties or curve of areas. 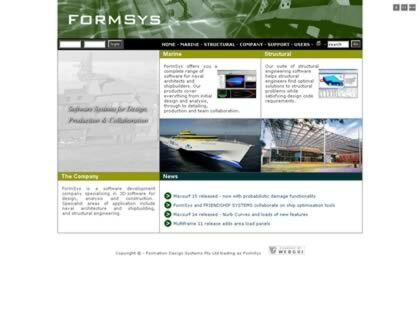 Web Site Snapshot: If available, above is a snapshot of the MaxSurf from Formation Design Systems web site at https://www.bentley.com/en/products/product-line/offshore-structural-analysis-software/maxsurf as it appeared when this site was added to the directory or last verified. Please Note that Boat Design Net has no involvement with the above web site; all content and images depicted in the above thumbnail are the property and copyright of MaxSurf from Formation Design Systems unless otherwise noted on that site. Description: Excellent Interface and large collection of tools and add-on modules. Model complex hull geometry with trimmed surfaces and visualise hull shape changes with dynamic updating. Modify with Parametric transformation. Extract key design data via lines, offsets, hydrostatic properties or curve of areas.